Yosemite National Park, California, as shown in NATURE: YOSEMITE on PBS. After suffering through years of drought, the region experienced a blanket of snow. Photo courtesy Joseph Pontecorvo/©THIRTEEN Productions LLC. “Yosemite is natural beauty on a grand scale.” That statement is hard to dispute if you’ve ever visited the National Parks (Sequoia, Kings Canyon and Yosemite) in the Sierra Nevada mountains stretching some 400 miles through eastern California into Nevada. 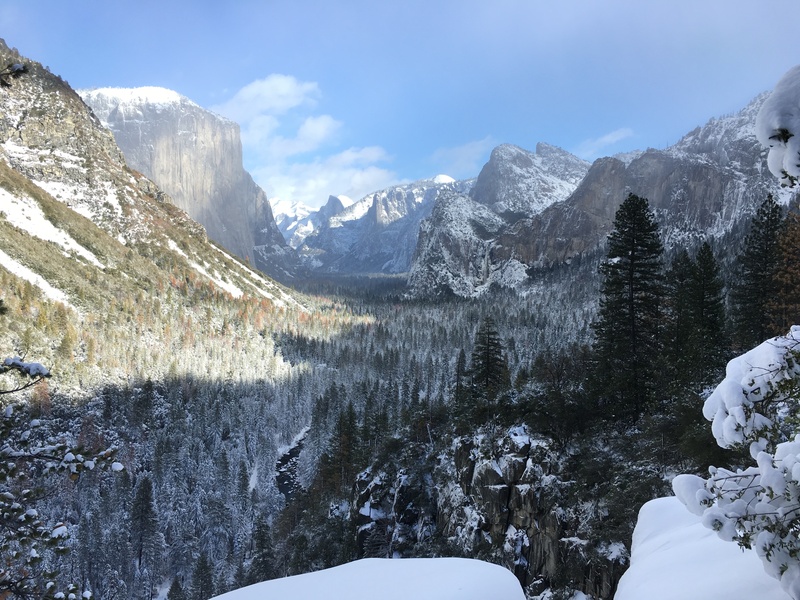 In Yosemite, a timely episode of NATURE debuting tonight on PBS, we are not only reminded of the region’s extraordinary beauty but the challenges faced by its complex ancient ecosystem due to climate change. This hour-long exploration will open your eyes to the impact of global warming on the Sierra Nevada, and it may also fill your eyes with tears at the thought of what we and future generations stand to lose. We are immediately introduced to various geologists, ecologists, researchers and wilderness explorers who study the region via hang gliders, kayaks, mountain climbing gear and snowshoes. As these scientists examine the collateral damage of continuing warming trends on the Sierra Nevada, they confirm that dramatic shifts in weather define the “new normal.” The insidious impact of climate change hovers over the fragile ecosystem currently blighted by drought and rising temperatures. 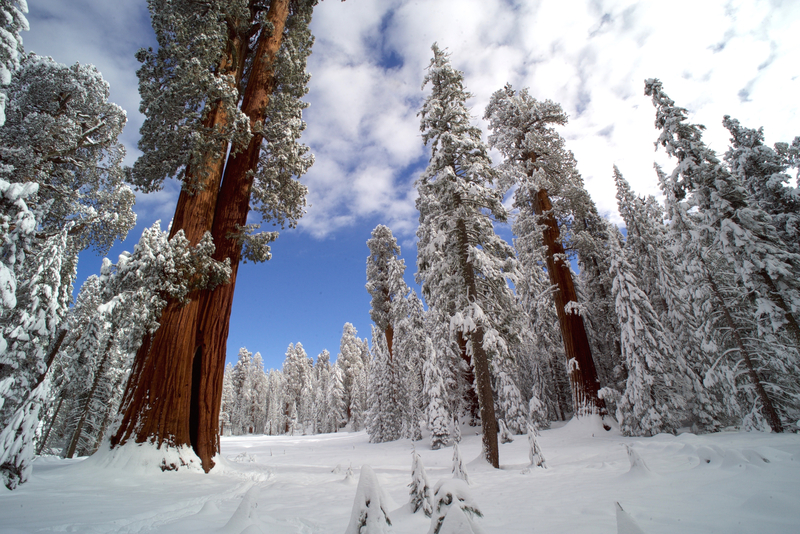 Sequoia National Park, California, is home to the largest trees on Earth. Their dependence on water from the Sierra’s snowpack is key to their survival. Photo courtesy Nimmida Pontecorvo/©THIRTEEN Productions LLC. Beautifully shot in 4K by filmmaker Joseph Pontecorvo and his team, the film zeroes in on the region’s giant sequoias. With documented lifespans of some 3,000 years and heights surpassing those of skyscrapers like the Empire State Building, sequoias continue to marshall on against climate change and global warming. But despite their history of resilience, they are experiencing and exhibiting the signs of unprecedented stress levels, triggered by high temps that pull moisture from their foliage. The importance of sufficient water (via the region’s annual snowpack) is key to their ongoing survival. The second element crucial to the giant sequoias’ stability and ability to reproduce is fire. The delicate balance of water and fire is clarified in Yosemite, as fire is a surprising and important player “vital” to the continued co-existence of the trees and wildlife that call the Sierra Nevada home. 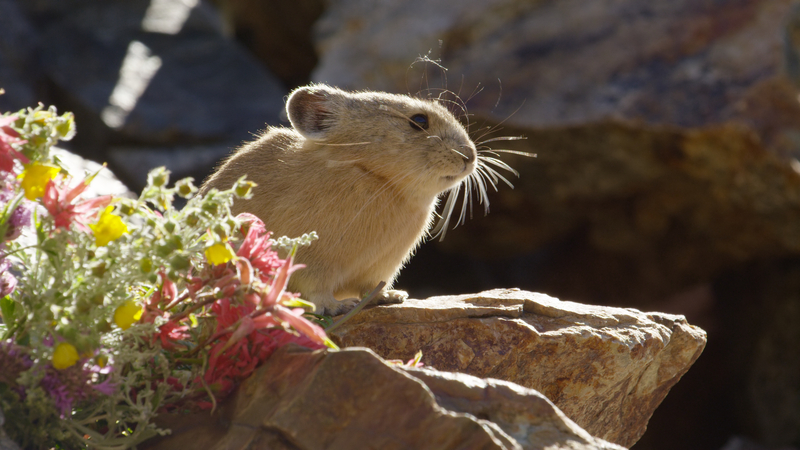 Featured in NATURE: YOSEMITE, Pikas are poor thermal regulators and are considered the “canary” of climate change. Photo courtesy Joseph Pontecorvo/©THIRTEEN Productions LLC. The wildlife denizens of the region are precariously perched on the abyss incited by climate change as well…from the tiny, frenetic Pikas and wily coyotes, to the Peregrine Falcons and Sierra Nevada Bighorn Sheep. While the numbers of Peregrine Falcons and Bighorn Sheep are currently on the rise due to the admirable work of recovery programs, they now face seasonal changes that threaten to upset the balance in their home turf and decimate their food supply. The film crew also visits the valley’s glorious glacier-shaped granite landmarks, El Capitan, Half Dome and Sentinel Rock, as well as Bridalveil Fall, Horsetail Fall and the iconic Yosemite Falls, one of the tallest waterfalls in North America and fifth highest in the world. Yosemite, framed by a compelling narrative read by actor Kevin Kline, ends with the annual convergence of determined photographers on a riverbank psyched to capture the instant in February when sufficient snowmelt and the setting sun converge to turn Horsetail Fall into a glowing ribbon of fire cascading down El Capitan. It’s a heart-stopping moment that reminds us of what glorious gifts Mother Nature has to offer and how important it is to protect and cherish them for future generations. Bravo to the National Park Service and all of the regional environmentalists committed to that endeavor and to Joseph Pontecorvo, his team and NATURE for this timely film. 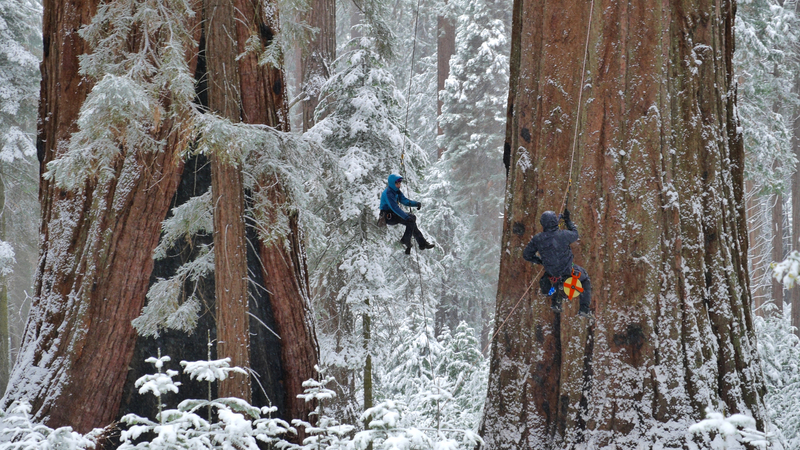 Researchers Wendy Baxter and Anthony Ambrose (center and lower right) measure a giant sequoia to gage its health and monitor the impact of climate change. Photo courtesy Nimmida Pontecorvo/©THIRTEEN Productions LLC. This entry was posted in TV and tagged Bighorn Sheep Recovery Program, Climate Change, Ecology, El Capitan, Global Warming, Horsetail Fall, Joseph Pontecorvo, Kevin Kline, NATURE, Nature and Wildlife, Sequoia National Park, Sierra Nevada Mountains, Yosemite. Bookmark the permalink.